“He knew how to make thirty-six million French men obey him without any authority but his genius and because he surpassed all the conquerors that preceded him.”1 As first consul and emperor, Napoleon’s influence and power extended far beyond that of France, and he caused an unprecedented reaction among his contemporaries and historians alike. Studies of Bonaparte are continually appearing, from paintings, portraits and caricatures to poems and songs, diaries, journals and newspapers; he is forever present. This is a comparative study of how the British and the French felt about the death of the Emperor. An individual’s reaction to his death and to the return of his mortal remains varied depending on whether they were a member of the popular classes, a close friend or politician, and whether they were French or British. Furthermore, the different representations of Napoleon are not only due to individuals’ various interpretations but also due to the complicated character of Bonaparte. Worse still, he is a multi-faceted figure – military hero, emperor of the people, and French citizen – meaning that it is often difficult to say when one aspect differs from another. He appealed to so many people across the world; “he has been called a father of modern democracy and of fascism: the very range of the different groups who claim him as their inspiration reflects the quality of the myth that has grown around his name.”6 However, a lot of the opinions and views on Napoleon are built around this legend and myth, which was in part constructed and deconstructed during his lifetime and exile on St Helena. Napoleon himself spent a lot of time during his exile rewriting his career. For him there was nothing more important than being remembered posthumously. “Napoleon himself said, ‘I live for posterity: death is nothing, but to live defeated and without glory is to die every day. '”7 R. S. Alexander notes that “Napoleon sought to immortalize himself through direction of how he was represented’;8 despite being unable to control everything that was said or written about him, Napoleon was very strong willed about the way he wanted to be seen, particularly in his own country. This explains to some extent why Napoleon tried to portray himself through the writings of Emmanuel Las Cases in the best light in order to prolong his legend after his death. The case of Napoleon’s death is also extremely charged, politically speaking, firstly because Napoleon had his own political group and followers, and secondly because his death and the Retour des Cendres were used to various political ends. Napoleon was such an important political figure that his death would not just be the end of a human figure; it would be the end of a whole ideal, a regime, and a way of thinking. This explains to some extent why the Retour des Cendres was celebrated in such a spectacular way. After the fateful battle of Waterloo, Napoleon asked the British government for political asylum; consequently exiled and imprisoned on the island of St Helena in 1815, he was to remain there until his death. His death was simple and undignified, unbefitting of such a political icon who may have once envisaged a more heroic death in battle or an honourable sacrifice in the name of democracy and the French nation. Nevertheless, his exile and ‘simple’ death did not affect the mystery and admiration that surrounded him. One of the earliest accounts of his death comes from Mme Bertrand and her daughters, who looked after him during his exile. When Mme Bertrand rushed her daughter and sons to see Bonaparte before he died, she was “shocked and overpowered […] at his pale and disfigured face where they had been accustomed to see only an expression of grandeur and goodness”.10 Her reaction shows two things. Firstly, it is clear that throughout his life in exile until his last day, Napoleon dressed and presented himself as the grand Emperor he once was; on his death bed, however, he was reduced to a mere human. That said, not all accounts seem to agree with Mme Bertrand. A certain Dr Shoot noted that “In death the face was the most splendid I have ever beheld; it seemed moulded for conquest”, whilst Dr Henry – also in attendance – recorded “All admitted they have never seen a face more noble, classical, and peaceful”.11 One reader of The Irish Penny Journal wrote “The beauty of his delicate Italian features was of the highest kind; whilst the exquisite serenity of their expression was in the most striking contrast with the recollections of his great actions, impetuous character, and turbulent life”.12 Although these reports and comments appear contradictory, this is proof – to a certain extent – that people continued to idealise the emperor after his death and saw in him what they wanted to see. Like those depicting him in life, the paintings of Napoleon on his death bed also interpreted his image in different ways. The painting by Horace Vernet, Napoleon on his death bed, shows the emperor with a wreath, similar to the one that Jesus Christ is depicted with on his execution.13 Bonaparte’s complexion however does not resemSupprimer l’image mise en avantble one worthy of the Son of God: it is very pale, whilst his face appears a lot thinner than in any of his other paintings. Vernet represents the two contradictory perceptions of Bonaparte, one of the hero and saviour of France, and the other a fragile mortal at the time of his death. Although it seems obvious that individuals on their death bed appear pale, Napoleon was so admired and revered that many representations show him with a holy glow, as if even death cannot touch him. Like Vernet’s composition, Jean-Baptiste Mauzaisse’s painting of Napoleon on his death bed is a regal depiction of Napoleon.14 He is dressed in his military uniform and although his face lacks detail, he still seems full of life. He even appears to have a slight smile etched across his face, in marked contrast to Vernet’s painting, in which he appears feeble. They both however represent him in his full glory, whether it is through comparison with Christ or depicting him in full military dress. The first signs that Bonaparte’s death would prove a significant moment in history – one which would fascinate people across the world – came immediately after his post-mortem. The linen that was on the bed during the examination, “though stained with blood”,15 was torn into pieces and given to those in attendance. This is the first example of people collecting Napoleon memorabilia in an almost fanatical fashion, and although it seems like a strange element to collect, it was the first opportunity people had to have something that had belonged to the once mighty emperor. In similar circumstances, a rowdy and uncontrollable crowd besieging Bonaparte’s room might perhaps have been expected. However, the crowd stood “inanimate […] without disorder and in respectful silence”,16 perhaps proof of the awe in which Napoleon was held on the island. This can also be seen in the way his funeral was conducted at Longwood. Everyone gathered and “never a spectacle so sad and solemn had been witnessed in these remote regions”.17 He was laid to rest in a tomb under a willow tree with nothing but a plain gravestone to mark the spot. This was a very bare and simple resting area, far removed from the extravagant funeral the French public would have expected for their hero. The islanders’ reaction to Napoleon’s death was an emotionally charged one, due in no small part to their proximity – both geographically and emotionally – to the late Emperor. The reaction to his death in mainland France was no less impassioned. The amount of publications, articles, and essays published in the month after his death was astronomical. Although the news did not come as a great shock, many French felt a deep personal lost. The number of histories of his life that were published is astonishing; the extensive collection available on Gallica,18 offering merely a selection, gives an idea of numbers. Although some – including many royalists who were less than distraught to learn of the former emperor’s death – chose not to declare their love for Napoleon, many used his death as an opportunity to defend him and glorify his achievements. One very good example of this is a publication entitled Pensée d’un patriote sur Napoléon Bonaparte, the goal of which was to prove how much Napoleon meant to France.19 For the publication’s author, it was a civic duty to tell the truth about the famous prisoner of St Helena.20 Summing up very adequately in what high esteem the French still held Bonaparte who « même vaincu a Waterloo se présente à nous avec un appareil de gloire »,21 his essay is a passionate one on the military glory of the emperor. What he lacks in facts and accuracy he makes up for in passion for his idol. Although many people continued to hold Napoleon in high esteem, there were equally those nevertheless aware that he had his flaws. In Vers et romance sur la mort de Napoleon Bonaparte,22 Alexandre Barginet writes « Il est tombé, ce géant redoutable, dont le nom seul rappelle les grandeurs ; il fut par fois et Superbe et Coupable, mais ses revers égalent ses erreurs. »23 Although he celebrates Napoleon’s victories, he also points out that he did make mistakes during his reign. However, Barginet still ends his piece on a passionate note, asserting that his achievements nevertheless outweigh his flaws. The sadness felt at France’s loss is emphasised in the repeated use of « il n’est plus là ! »24 Although Barginet’s piece stands out from the others because he does accept Bonaparte’s faults, the author nevertheless remains a typical admirer of the emperor in that he cannot help but think highly of him and feel great sadness at his loss. Not only did Napoleon’s death provoke sadness, but it also prompted a sense of pride of being French, along with feelings of bitterness about his death and burial on St Helena. In his essay Souvenir et regret d’un soldat, à Napoleon Bonaparte,25 Dublar expresses his discontent at the Emperor dying on St Helena, isolated and away from his beloved country – « Il n’a vu à sa dernière heure, que le sourire féroce de ses ennemis, il en eut pitié en fermant la paupière »26 – a fairly typical French interpretation Britain’s feelings towards Napoleon. Filled with regret at not seeing his emperor die, the author blames the higher ranks for his exile. This was a sentiment felt by many other French people, who believed that Napoleon should have died in France.27 However, there was also a large part of the population that felt that Napoleon dying away from the revolutionary masses was essential in order to avoid any revolutionary agitation or violent demonstrations.28 For many, the death of Bonaparte was simply a distant event, details of which were announced in newspapers. Unsurprisingly, the death of Napoleon had a great impact on the French, both on the island of St Helena and on mainland France. Yet their sentiments were not universally the same. There was certainly an overwhelming feeling of loss and sadness, but not all the French population praised him after his death. Despite this, many still felt great pride in being French and expressed their feelings through articles, journals and paintings, as well as more generally through the collection of memorabilia and the celebration of his legend over the course of the year. Napoleon was a political figure whose influence spread beyond France, throughout Europe, and across the world. Historically, the English had for a long time been France’s arch-enemy, especially during the Napoleonic wars. However, the reaction to his death in England could in many ways be described as unexpected. In newspapers and journals, writers paid their respects to a man whose political views they may have disagreed with, but for whom they felt great admiration. Napoleon’s exile on St Helena very much contributed to this way of thinking. Dying alone in exile transformed Napoleon from a political tyrant into a mere human. His death did not eliminate any of the political questions the British still had regarding the emperor, but it result in much soul-searching regarding the morality of his exile. The British understood as well as the French the poetry of Napoleon’s exile on St. Helena. Haydon’s famous painting of Napoleon looking out from his island of exile inspired William Wordsworth to write a poem describing the landscape of St Helena.31 The island, in Semmel’s words, is “defined by absence”32 and Wordsworth remains elusive, conserving the mystery that surrounded Napoleon. For Wordsworth, Haydon’s painting was “sublimely empty”,33 leaving the reader with the impression that Napoleon was contemplating his own life and achievements, an “historical figure [who] considered himself as historical”.34 In stark contrast to Haydon’s paintings, Marryat’s sketch – drawn, allegedly, fourteen hours after his death – is possibly one of the simplest produced of the emperor.35 Representing Napoleon lying on his bed, his body is covered in a sheet, just his visible, with a cross placed on his chest. He is not wearing his traditional hat and his face is drawn and lifeless. This is a very simple representation of Bonaparte, much unlike many depictions produced of him. The fact that this drawing was done so quickly after his death (if the dating is to be believed) shows just how much Napoleon still fascinated the British public. 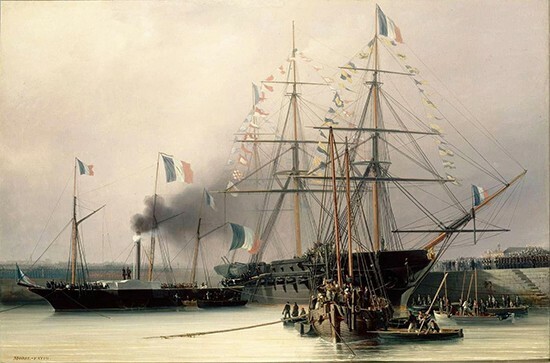 Like Wordsworth’s poem and Haydon’s painting, it shows to what extent the emperor’s exile on St Helena contributed to the forging of Napoleon’s posthumous reputation in Britain. Without his period in exile, it would be fair to say that he would not have been remembered in the same way, more likely remaining a political figure, devoid of humanity. Napoleon was not however always represented in the romantic manner favoured by Wordsworth and Haydon. In an anonymous poem, Bonaparte is characterised in a much more aggressive manner, with descriptions of him as “The Beast” and the emperor “who every king on earth doth fear”.36 The poem focuses on the career of Napoleon taken from a military angle, portraying him as a tyrant and an aggressive character. This and Wordsworth’s poem may be very different but they represent the inherent complexity of the emperor’s character. He encompassed so many roles within his lifetime – emperor, war hero, tyrant, and exiled prisoner – that different individuals could draw on disparate aspects of his life. It is therefore no surprise that a man with such an eventful life would have so many different representations after his death. These complex, seemingly contradictory reactions were even shared by Sir Hudson Lowe, the governor on St Helena, who wrote “He has been England’s greatest enemy, and mine also, but I forgive him for everything. At the death of a great man like him, we should feel only deep concern and regret”.37 There was a great sense of admiration for Napoleon which was in part fuelled by his exile. Robert Postans, who attended the funeral on St Helena, remarked on the great irony of his funeral: “The coffin was borne upon the shoulders of English grenadiers, and followed by the soldiers who had contributed more towards his downfall than those of any nation.”38 But at the time of his death, there seemed to be reconciliation between the two countries. There was no longer any reason for Britain and France to fight and they both joined in remembering and respecting a man of great influence in both countries. There is no doubt therefore that exile contributed to Bonaparte’s posthumous image. And whilst reaction to his death on the island appears intense, reaction on the mainland proved to be just as strong. One of the most striking acts of tribute to Napoleon was the efforts gone to by John Sainsbury.39 He was an admirer and avid collector of all things Napoleonic and in the 1820s opened an exhibition presenting his collection of Napoleon memorabilia. The reaction to this was certainly quite mixed. Some visitors proved resistant and were unconvinced by Sainsbury’s attempts to demonstrate Napoleon’s wonderful character and uncommon genius. Others relished the exhibition and the relics of lost battles and causes which reminded them of the glory of a victorious Britain which had defeated France. The fact that Sainsbury nevertheless managed for many years to make a living out of his exhibition (through the charging of an entry fee) indicates what a phenomenal success it was. There was clearly a market for such fascination, something that Sainsbury’s collection of curios did little to dampen. The plays and poems are just one aspect of how the British viewed Napoleon. The numerous newspaper articles offer further insight into how people saw Napoleon at the time of his death. Many of these are very lengthy and give detailed descriptions of Napoleon’s life, his funeral and the cause of death. An article in The Liverpool Mercury displays mixed emotions towards Napoleon.47 Starting off with “Napoleon Bonaparte has at length paid the debt of nature”, the article’s first sentence appears to take a strong stance on Napoleon’s death. Although not a particularly favourable start to the article, it goes on to explain that everyone is fascinated by the posthumous image of Napoleon, assuring its readers that “every public journalist, whatever his political creed may be, will pen his epitaph”. The author’s reference to “political creed” suggests that he believes public opinion on Napoleon will be influenced less by nationality than by political ideology. The article finishes by stating that “Napoleon has not lived nor died in vain – his career has read hereditary despots a lesson, from […] which they might profit”. Although the journalist appears glad that Napoleon is gone, he still feels that his life – although not an exemplary one – should be used as an example of what not to do. Although not celebrating Napoleon’s death, the journalist is nevertheless aware of the enormity of the moment. Similar words can be found in The Morning Chronicle.48 Once again, the journalist is aware that Napoleon produced “everywhere a strong sensation”. However, in contrast with The Liverpool Mercury, he is keen to leave Napoleon’s mistakes in the past, declaring “He now belongs to history”. This does not however mean that he glosses over Napoleon’s mistakes, remarking in particular that “his selfishness proved the cause of his downfall.” These two articles ably demonstrate Bonaparte’s contradictory nature and give us an insight into the different points of view people held of him. Whilst these articles show us the reaction people had in mainland Britain, a letter from an officer to his mother that was published in The Mirror gives us an insight into what a British person based on St Helena thought of Napoleon’s death.49 In his letter, the officer displays more respect for the late emperor than is perhaps evident in the newspaper articles already mentioned, capturing the deep sense of loss that was felt by many on the island. By attending the funeral, the officer understood the feelings of the French and what an important figure he was to France. Sympathetic to “poor Napoleon” who was exiled far away from the country which loved and continues to love him, he describes in detail the funeral held at Longwood, and is very surprised by its simplicity, remarking frequently on the “plainness” of the ceremony and event. All these sources tell us many things about the British reaction to the death of Napoleon. That his exile on St Helena contributed in a positive way to his posthumous reputation in England seems clear. Views shifted; the political tyrant had returned to the mortal plain. However, Napoleon’s complex character ensured that the way in which he was remembered varied according to what people wanted to remember him for. Whether it was Emperor of the French, the icon of wars across Europe, or the prisoner in exile, every aspect of Napoleon’s life was remembered after his death. Although the British sources appear more distant when compared to the French reaction, the same themes and issues recur, and the division of popular opinion is just as great. Nevertheless, the death of Napoleon was to have more of an impact on Britain than a later event would: the return of his mortal remains to France. Napoleon’s death could be described as an anti-climax when compared to his glorious life. However, his ‘greatness’ would be celebrated in full with the triumphant return of his mortal remains. The procession and parade organised by the authorities presented a level of splendour never before seen. However, the return of Napoleon was not a simple matter of patriotism. The political intent is one that has to be examined closely in order to understand how the French population celebrated their emperor’s return. Louis Philippe, the Orléans king, was in power at the time of the Retour des Cendres. This was not the first time attempts had been made to return his mortal remains to France. When Napoleon died, an appeal was immediately made for the return of his body. Contrary to popular belief at the time, it was not the English who were preventing the return of his remains. Indeed the English government had made it clear to their French equivalents that « le gouvernement anglais ne se regardait que comme le dépositaire des cendres de l’Empereur et qu’il le rendrait à la France dès que le gouvernement français lui en témoignerait le désir ». But in 1821, the government of Louis XVIII was little disposed to bringing the Emperor’s mortal remains back. Louis did not want Bonapartist sentiments to return to the surface, especially with the royalists in power and the potential for a coup d’état. When Louis-Philippe ascended to the throne a petition was presented to the Chambre des députés in an appeal for the return of Napoleon. Although Heulard de Montigny50 “considered the reign of Napoleon to be the most brilliant time for France”,51 he failed to convince any of his colleagues. Throughout the 1820s and 1830s other attempts failed. So why did Napoleon make it back after twenty years? Publicly there was a lot of support for the return. Victor Hugo summed up the public opinion in his work Ode à la Colonne.53 His, and the French public’s anger, towards the députés who did not vote for the return of the mortal remains and who were thus regarded as cowards, was summed up in the lengthy poem: « Vous avez peur d’une ombre et peur d’un peu de cendre. Oh ! Vous êtes petits ! »54 To some extent, Hugo was right. The government feared that by bringing back Napoleon’s mortal remains, its position would be weakened. Although this seems like an overreaction on the part of the government of the time, it shows just how much of an impact Napoleon had had on the French population, even after his death. The French public was forced to wait until Thiers became Président du Conseil before their beloved Emperor could return to France. Disagreement regarding the decision to bring back the remains of Napoleon remained within the government; French popular opinion was to prove similarly divided. An abundance of newsprints, lithographs, paintings, and songs exist to offer us a unique insight into how people viewed the Retour des Cendres. Of these, a few themes common to all the media mentioned above stand out. In particular, his portrayal as a prince or the Christ is a recurrent theme, and the same representative symbols appear throughout. Gustave Tassaert’s painting, France and the Prince de Joinville at the Tomb of Saint Helena, which recreates the resurrection of Jesus Christ, is one of the many representations of Napoleon that plays with Christ symbolism.59 Napoleon is depicted, complete with shining halo and white cloth draped over him, emerging from a tomb. On his right is a figure very similar to the Madeleine, adorned with the royal coat, who is probably his wife. To his left, there is an open door which is similar to the stone rolled away from Christ’s tomb. This image is a very clear echo of the resurrection of Jesus Christ and gives the reader the idea the Napoleon is not only the Emperor of the French but also saviour of the nation. The image that combines the different aspects of Napoleon’s life and all that he had achieved for France is Adolphe Lafosse’s lithograph.62 In it are present his famous battles, the Code Napoléon, symbols of his victories abroad (such as the Egyptian pyramids), crowns strewn about the floor, reminders of his various roles in French government (First Consul and emperor) and, in the background, crowds of adoring subjects. All of these images represent Napoleon as a triumphant hero, and his return can be compared to the return of the prodigal son. Although there may have been some political discord when it came to the Retour des Cendres, it is clear that from the point of view of the French public, his return was the welcoming home of a long-lost son. But as the French public rejoiced at the arrival of their emperor, reaction on the other side of the Channel was decidedly different. Reaction to Napoleon’s death was perhaps as considerable in England as it was in France. Napoleon was after all a figure of European and international importance. The return of his mortal remains however provoked little reaction in the British Isles. It was of course reported in the newspapers, but it was not the sensational news that it appears to have been in France. Although the British observed the death of Bonaparte, the procession received limited coverage. This lack of enthusiasm shows us not that the British did not care about Napoleon, but rather that the Retour des Cendres was an event of fundamental importance to the French, one that mattered deeply to them. The return of Napoleon’s mortal remains was an elaborate affair. It was not simply a question of bringing the coffin back and laying it to rest; it was to be a long procession all the way from Le Havre to the centre of Paris. It would be an opportunity for people who were not living in Paris to pay tribute to their idol. The coffin was exhibited for six days on La Belle Poule in Normandy, where it was reported that 60,000 people came to pay their respect to the late emperor.63 The coffin was then transported down the Seine to the centre of Paris. Accounts tell of every bridge over the Seine lined with people, waiting to get a glimpse of the elaborate coffin.64 Many were overjoyed, whilst others were disappointed that the boat did not stop longer at the bridges. The Morning Chronicle how, at a bridge in Le Pecq, “a band of two-hundred performed solemn symphonies as the steamer came up the river”. It finally anchored in Neuilly on 14th December where it immediately became a place of pilgrimage for the people of Paris. The celebrations in Paris were by far the most elaborate. The lithograph of 1840 by Napoleon Thomas depicts in great detail the sumptuous procession in Paris.65 The cortege was so heavy it had to be drawn by sixteen black horses under the Arc de Triomphe, down the Champs Elysées, and across the Seine to the church in Les Invalides. The cortege was covered in allegorical figures and symbols of Napoleon and his greatness. From the crowned ‘N’ to the eagles and military decoration, the cortege was a celebration of his reign and of the “good old days”. Thomas’ lithograph ably expresses how the cortege was the centre of an extravagant performance, with armies marching alongside the remains of the emperor. Furthermore, the beautifully decorated seating arrangements at the side of the Champs Elysées and at the Place des Invalides “enhanced the theatrical aspect of the ceremony”.66 At the end of the procession, the casket that had been transported in the mobile, sculptured tomb was placed on display for millions of visitors to admire it. However, the neo-classical decorations, despite the grandeur, were all ephemeral. The street decorations and adornments on the coffin were all made out of wood, canvas, and plaster. This was a sign that although the celebration was to be remembered for decades to come, the government had no intention of leaving permanent traces of the ceremony, a clear indication of the threat (perceived or otherwise) posed by Napoleon – even twenty-years gone – to the government. From the celebrations and ceremony emerged two key themes: “civic virtue and military glory”.67 These two principles were exploited because they did not provide a threat to the July Monarchy; quite the opposite in fact. Civic virtue and military glory were two of the most highly regarded qualities in French society. The procession in honour of Napoleon would have been talked about and remembered for many years after. However, it was also a day that left the government and the upper classes – who recognised that Napoleon was a character capable of stirring great and conflicting emotions – uneasy. Nor was it without its own hidden agendas, with Thiers’ government profiting from the event to bask in its reflected light. And the procession was only the beginning of the extravagant celebrations planned for Napoleon. His tomb was to be the ultimate tribute to his multiple qualities and enduring appeal; however, this too was to prove a contentious issue. Although bringing back Napoleon’s mortal remains took twenty years – an eternity to some – the conception and building of the tomb was to prove another long chapter in Napoleon’s eventful posthumous existence. The first issue that faced the government was the location of his resting place. In his will Napoleon had stated, « Je désire que mes cendres reposent sur les bords de la Seine, au milieu de ce peuple français que j’ai tant aimé. »76 However, just as with the procession, the government was very aware that they had to decide on just how conspicuous a part of Paris’ urban fabric they wanted to make his tomb. Finding the resting place for Napoleon was not just a logistical problem, but a deeply political issue as well. In his address to the Chambre des députés, Lamartine analysed the proposed locations. He dismissed the Colonne Vendôme and the Eglise de la Madeleine because their central positions in Paris meant they would likely have become the focal point for disorderly Bonapartist gatherings, whilst the Basilique de Saint-Denis was deemed unsuitable because it highlighted the links with France’s royal past. The Arc de Triomphe was inappropriate for both logistical and ideological reasons: if Napoleon’s tomb rested there, there could be no triumphant military displays in the future, and the monument was also considered too pagan in design. Finally, the Colonne de Juillet could not have been a fitting place of rest since there were no strong ties between Napoleon and the July Revolution. Lamartine also stressed in his address that the location of Napoleon’s resting place had to be isolated because “he was singular and deserved a single monument”.77 Whether it was his political status that called for isolation, that he should be removed from daily life in order to avoid transforming the site into a place of riots and disruption, or simply because Napoleon deserved a monument to himself, Lamartine was very clear that the former French emperor’s final resting place should be considered very carefully. The idea to have a competition was one that was not popular with everyone, particularly Thiers, but with his influence weakened (largely to do with his foreign policy), it was seen by the government as the best solution for such an important monument. However, the competition was poorly publicised, and it was unclear what the rules were and who was allowed to enter. Although it was designed for only artists to compete, the government made no real attempts to stop anyone else submitting their designs. Since the competition seemed to be open to everyone and because the government had pushed back the entry date twice, some artists were reluctant to participate. Prominent and well-known artists, such as Charles-Joseph Toussaint and Antoine Allier, refused to enter or simply withdrew their ideas. Clement Pruche’s caricature of the contest sums up neatly how various people felt about the competition: there were many well-designed projects but choosing one out of them would prove a very difficult task.84 Furthermore, as the outlandish designs in the cartoon demonstrate, many of the projects were extremely, indeed overly, ambitious. Although many of the project designs have now been lost, the limited selection that remains shows just how different and complex some of the plans were. The designs of Antoine Etex are particularly interesting. The first one he created was before the location of the tomb had been decided; this he submitted to Louis Philippe directly, who turned him away, believing that the French were not ready for such a monument.85 As soon as the news reached him that a contest was open to design the tomb, Etex converted his idea so that it would fit under the dome.86 Although the idea remained the same, there was one subtle change that evokes the broader problem in representing Napoleon. In his first design, Napoleon was dressed in his military attire, whilst in his reworked second version, the emperor is clothed in his imperial dress. How was Napoleon to be remembered: as the military hero or the imperial, essentially civic, leader? Taking into account the chosen site of Les Invalides, and by studying some of the designs for his tomb, it is clear that many wished to remember the military hero. Napoleon’s iconic character and diverse roles during the regime were just some of the problems that gave the architects and artists much food for thought. Perhaps this goes some way to explaining why the designs of tombs varied so much. Many of them, such as Antoine Rivoulon’s project, were large in scale and very elaborate.87 With nearly twenty allegorical figures representing everything from war to glory to religion, his design was a celebration of Napoleon’s accomplishments as emperor, and an international icon (with the presence of a globe), whilst still conserving the traditional Napoleonic symbols such as the imperial eagle and “N” emblems. In comparison, Henri Labrouste’s project was a simple and modern take on funerary edifices, with a bronze shield designed to cover the tomb which would lie in a crypt below.88 The shield was to be supported by an eagle at each side, which meant that it would not be totally closed. It still kept the traditional “N” and eagle, yet compared to many of the other designs, it was very understated. Labrouste’s representation sought more to commemorate and protect the tomb than to glorify his life. The choosing of the location of the tomb and the competition for the construction of it were of such great importance to the French nation that any decision was not taken lightly by the government. Feelings towards Napoleon were so strong – both positive and negative – that every step of the way during the construction of his tomb there were debates and arguments. Even in death, Napoleon continued to enflame passions. Napoleon will always be remembered in different ways; however, judging by the construction of his tomb and the events that surrounded the project, it is fairly safe to say that his military exploits were to great importance to the French public (even if he was ultimately defeated at Waterloo). Eventually, Visconti was chosen to design the tomb; it was finally finished in 1860, and offered a balance of military hero, civic leader, and imperial ruler. During his lifetime, Napoleon Bonaparte was an enigmatic and complicated figure, and this was very much the case after his death. His posthumous depictions drew on his military career, his imperial reign, and – more simply – his legend. The French and the British did not have overwhelming divergent opinions regarding the late emperor, although it is hardly surprising that sentiments were far stronger in France than in Britain. However, what is surprising is the amount of interest the British public took in Bonaparte. The example of Robert Postans, who attended both of Napoleon’s funerals and experienced first-hand the overwhelming emotion felt by the French, is perhaps the most striking.89 His account highlights the contrast between Napoleon’s two funerals: the simple and private ceremony in Longwood, and the extravagant and over-the-top procession in Paris. Both funerals were however extremely silent, which shows just how much respect people had for the emperor, whatever their nationality. The large number and the variation of sources have shown us what impact Napoleon’s death and the Retour des Cendres had on Britain and France. However, it is clear that the return of Napoleon’s mortal remains had a far more profound effect on the French than on the British. His return was a momentous event for the French population and although not all agreed on every aspect of his return, it was an historic event which – on the whole –united the French people in recognition of their former emperor. Whether it was through different articles, paintings, or the designs for his tomb, Napoleon was depicted in many forms after his death. This abundance of iconography and interpretations merely intensified the aura of mystery and fascination around him. Clearly the public’s appetite for all things Napoleon would prove difficult to sate. It is certain that his death in exile and the wait of twenty years for him to return to his beloved country was one of the biggest contributing factors to the endurance of his posthumous image. His exile only added to the mystery that surrounded him, and contributed positively to his reputation in England. It was his deeds in life that ensured that he would never be forgotten, but the fact that it took twenty years for Napoleon’s body to return home made the restitution even more exceptional and gave the French public time to grow fonder of their late emperor and to come to terms with his impact on the nation. A complex individual who combined profound historical achievement with a rich romantic legend, Napoleon Bonaparte is like few other characters in the history of the modern world. 4 It should be noted that the Dictionnaire Larousse was still in its early days, which may explain the different definitions. 29 It should also be noted that although this was an event to show sentimental attachment to the late emperor, it was also an occasion for people to show their unhappiness with the current political regime (see "15 août 1844", Revue de l'Empire, vol. 2, pp.307-310). 50 Charles-Gilbert Heulhard de Montigny served as député for the Cher département between 1830 and 1831. 54 "You are scared of a shadow and scared of a bit of dust. Oh! How small you all are!" 57 It was Thiers who inaugurated the Arc de Triomphe (see Avmer, Funeral, politics, and memory in modern France, 1789-1996, p.70). 65 Appendix H, Napoleon Thomas, The Translation of the Ashes of Napoleon to the Invalides, in Driskel, As befits a legend: building a tomb for Napoleon, 1840-1861. Another print (Appendix I) by A Guey - Transfer of Napoleon's Ashes to the Invalides - can be found in Barbara Ann Day-Hickamn, Napoleonic Art: nationalism and the spirit of rebellion in France (1815-1848), p.139. 76 "It is my wish that my ashes may repose on the banks of the Seine, in the midst of the French people, whom I have loved so well", "Napoleon's last will and testament"
80 He was, however, popular with Thiers, which could explain why the government appointed him in the first place.